A certified keyboard legend, Keith Emerson was one of the most important figures to emerge from the thriving UK rock scene of the 1960’s and 70’s. He was known as one of the most prominent leaders in the progressive rock movement, fusing rock ‘n’ roll with a myriad of musical styles, such as classical, jazz and world music. A modern wizard of electronic and acoustic keyboards, most notably the organ and synthesizer, he set the standard for modern players. With both “The Nice” and “Emerson, Lake & Palmer,” Emerson composed and recorded some of rock’s most adventurous music and brought it to the masses with unmatched virtuosity and skillful showmanship. Born November 2, 1944 in Todmorden, Lancashire, England, Keith Emerson soon became a piano sensation in his hometown of Worthing, Sussex by the time he was fourteen years old. In his late teens, he moved to London, joined the band “V.I.P.’s” and later “Gary Farr and the T-Bones,” backing their mentor T-Bone Walker at the Marquee Club in London, also touring Germany, France and the UK. Some of his early influences were jazz artists Fats Waller, Oscar Peterson, Dave Brubeck, Jack McDuff and Big John Patton. Classical composers also became influential to his music including J.S. Bach, Aaron Copland, Demetri Shostokovich, Bela Bartok and Alberto Ginestera amongst others. In his twenties, he formed a band called “The Nice” with bassist/vocalist Lee Jackson, drummer Brian Davison and guitarist David O’List, which backed ex-Ike and Tina Turner’s singer P.P. Arnold. The group struck out on it’s own with a unique blend of classical, blues, jazz and rock. Emerson adopted the Hammond Organ as his instrument of choice during this period and soon gained fame for his outrageous stage antics and inspired musical performances. “The Nice” recorded numerous albums and appeared in a notorious concert at London’s Royal Albert Hall. Immediately after hearing “Switched on Bach” by Walter Carlos, Emerson purchased and experimented with one of the first modular Moog Synthesizers and became the first artist to tour with “The Moog” internationally with the help of its inventor, Dr. Robert Moog. In 1970, “The Nice” broke up and Emerson formed the legendary group, “Emerson, Lake & Palmer” (ELP) with bassist/vocalist Greg Lake and drummer Carl Palmer. They achieved instant fame with their debut at the Isle Of Wight Festival in 1970. The trio announced their arrival on the scene by tearing into a furious rock adaptation of Mussorgsky’s classic “Pictures At An Exhibition”, which concluded with a barrage of cannon fire. Their first single, entitled “Lucky Man”, from their debut album, “Emerson, Lake & Palmer”, ended with a startling new sound, the lead Moog synthesizer solo. This sound took the world by storm, and the band was on its way. ELP released six platinum albums between 1970 and 1977, including “E, L & P,” “Tarkus,” “Trilogy”, the cryptically entitled “Brain Salad Surgery”, “Welcome Back My Friends To The Show That Never Ends” and “Works Vol. 1”. They headlined the massive 1974 festival California Jam playing to an audience of over 500,000. Later in 1977, ELP toured with a handpicked orchestra, which performed Emerson’s “Piano Concerto No.1”. After touring with the orchestra, ELP continued on the road as a trio, releasing two more albums “Works Vol. 2” and “Love Beach” before disbanding in 1979. Between 1985 and 1990, Emerson collaborated with Lake and Palmer in two separate efforts, “Emerson, Lake & Powell” and the band “3” respectively. In 1992, ELP reunited with the critically acclaimed “Black Moon”. Subsequent world tours which resulted in the live performance releases of “Live at the Royal Albert Hall” in 1993 and “Then And Now” in 1999. In 1980, Emerson issued his first solo album, a Caribbean island inspired work called “Honky”. In addition, he recorded and released “The Christmas Album”, displaying his own unique interpretation of many classic Christmas songs along with original seasonal pieces. Soon thereafter, he turned to motion picture soundtrack composition, producing several film scores between 1979 and 1989, including the orchestral score for Universal Studios feature release, “Nighthawks”, starring Sylvester Stallone and Billy Dee Williams and cult Italian horror master Dario Argento’s “Inferno”. Emerson also realized a full length Japanese animated film entitled “Harmagedon” in which he received a gold record for the main title theme, “Children of The Light” sung by Rosemary Butler. Emerson also composed the music for Marvel Animation’s cartoon action TV series, “Iron Man” in 1994. Emerson went on to release the occasional collection of new material appearing on-stage. He even reunited with Nice band mates Brian Davison and Lee Jackson for a show in Glasgow, Scotland, in 2002 (Vivacitas). Along with the EMI classic release of the solo piano, “Emerson Plays Emerson” in the same year He penned an autobiography, “Pictures of an Exhibitionist” in 2003. He received the compilation treatment from Castle Records in 2005 with the two-disc “Hammer It Out: The Anthology”. 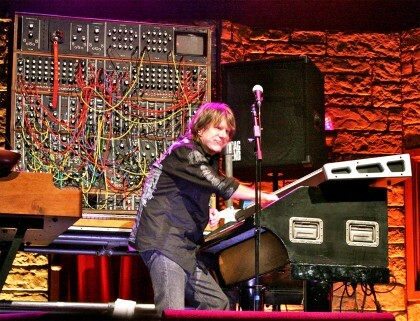 He toured in the USA, UK, Europe and Japan in 2004, 2005 & 2006 with his own “Keith Emerson Band”, along with occasional collaborations with various orchestras in Naples, Italy and Beijing, China to promote the environmental issues. Throughout the years, Emerson consistently won the Overall Best Keyboardist award in the annual Keyboard Magazine Readers’ Poll, since the magazine debuted in 1975 and held a seat of honor on their advisory board. He was honored at The Smithsonian Institution, along with Dr. Robert Moog, for his pioneering work in electronic music. Emerson released the new album, “Keith Emerson Band Featuring Marc Bonilla” with regular collaborator Marc Bonilla and producer Keith Wechsler in mid 2008 worldwide, and toured Eastern Europe, Baltic, and Japan following the release. Keith Emerson passed away of a self-inflicted gunshot wound in March of 2016.